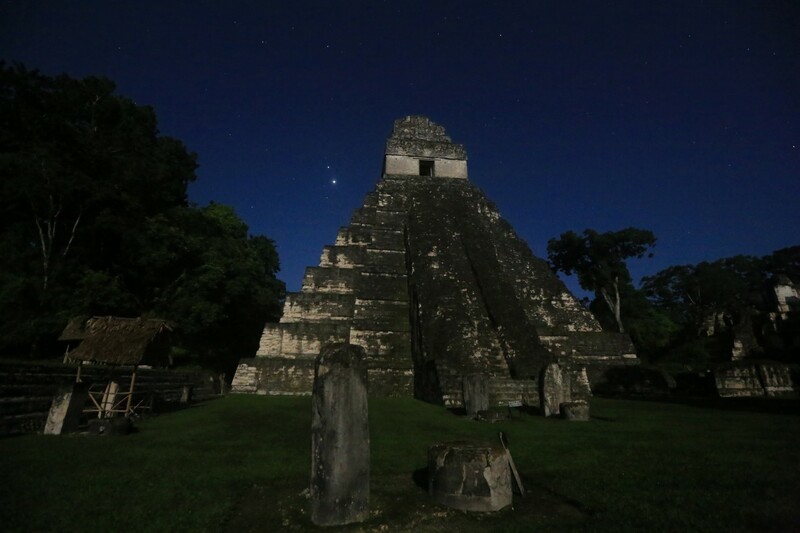 I’m sitting under the light of the full moon on a gigantic pyramid of limestone blocks with about 10 other travelers who have come to experience sunrise at Tikal, Guatemala. At the moment everything and everyone is pin-drop silent. We are 187 feet above the floor of the dense jungle below us. It’s treetops mixed with pillowy low cloud drips. We are extremely lucky to be here on a perfectly clear night and the stars are brilliantly shining down on the tree tops which are intermingled with pillowy low clouds of mist. The full moon provided a ton of light – this is a photo with no flash! The view far in front of us we see the shapes of two other gigantic pyramid tops in alignment with where the sun will be soon rising but we can already see them well thanks to the full moon that is completely illuminating the scene. The silence is broken by a noise that is unlike anything you will ever hear on the planet that is nearly impossible to describe. I had been told that the sound of the howler monkey sending it’s morning notification is strange but the word strange does the sound zero justice. Imagine a sound something like a Hollywood lion roar, now turn the pitch up on it a little bit, turn the volume of it up a little, add some gargling of nails in the throat, have it morph over time like a passing siren might and have it last about as long as maybe the noise of a 4 car train passing by you. I think maybe that might describe the noise. It gets more ethereal as the other howler monkey tribes in the area respond in sequence. The first one sounded relatively close and the loudest for sure coming from the left of the wide scene, next up we hear a response coming from far to the right, sounding more like it is coming from 1/2 mile away. Next up one more that seems to come from front and center in this picture – sounding like it’s coming from right in front of the temple that we are looking at in the distance. The round robin chorus continues and birds begin to pop into the field of view. Parrots start to scream and other voices start to chirp in as the jungle fully starts to come to life. 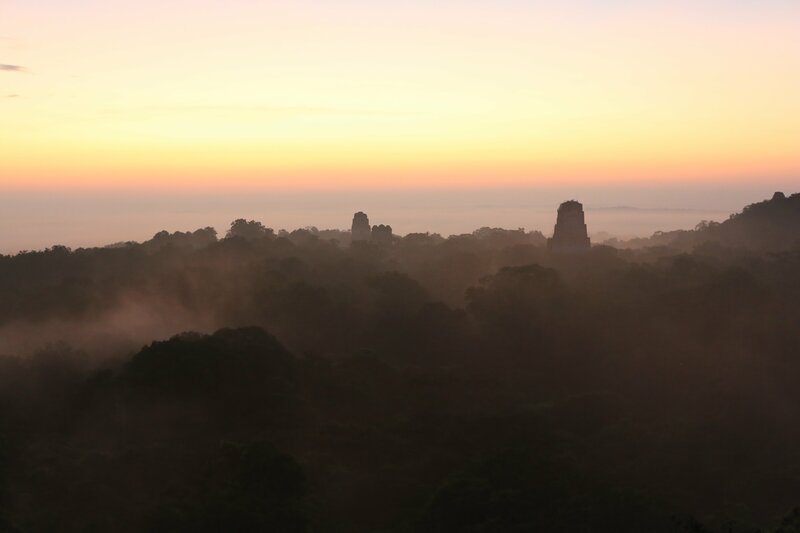 The colors start to unfold as the horizon starts to turn orange and the jungle starts to turn green in front of us. 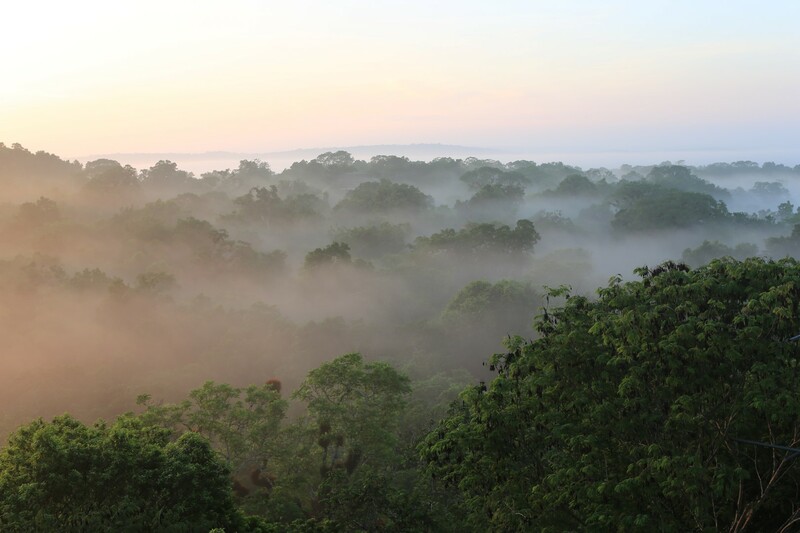 We are lucky again as apparently the thick rainforest clouds obscure the actual rising sun about 80% of the time. 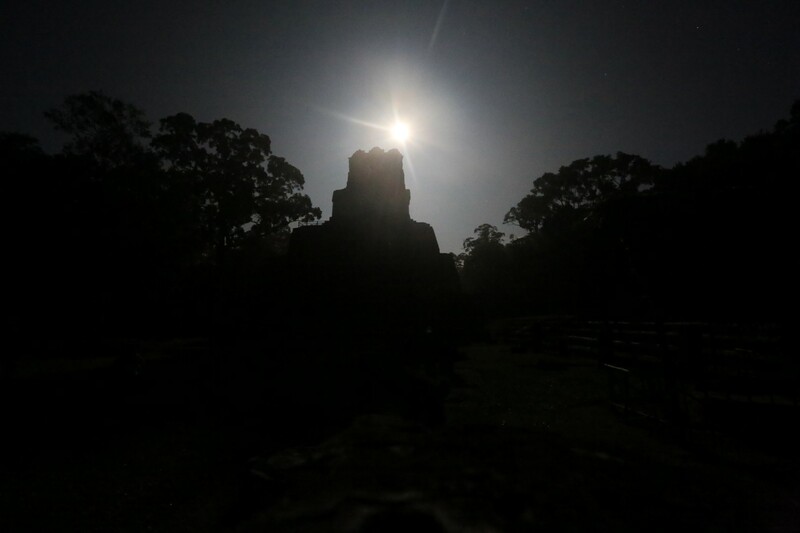 Not only do we get a full moon but we get a full round orange disk rising into the sky and lighting up our surroundings bringing the view of the temples in front of us into full daylight. Double plus cool. I signed up for the 2:50AM pickup which is then followed by a mini bus ride for over an hour and then a hike through the jungle at 4:30 with the climb of the 187 foot pyramid. Getting to sleep early in order to wake up at 2:50 had been a vain effort and I had very little sleep but it was all worth it. 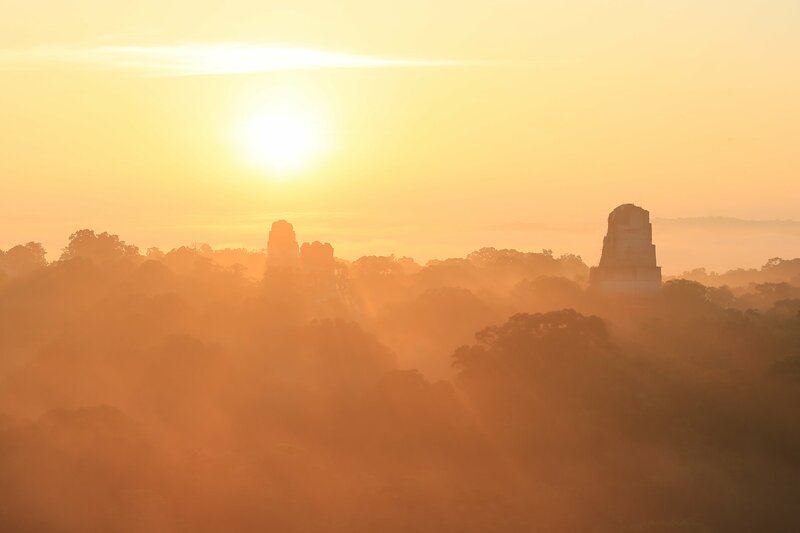 Here’s a big tip to anyone who goes to Tikal – do the sunrise tour, it IS worth it. It’s breathtaking. Watching the jungle come to life and in particular hearing the howler monkeys (which apparently happens every day) is an experience that is really magical and 100% worth the lack of sleep. Additionally you get to see the rest of the park before the crowds come and you can get pictures like these ones with few or no people are around. A trip to this part of the world without visiting some of the Mayan sites would be be a shame. 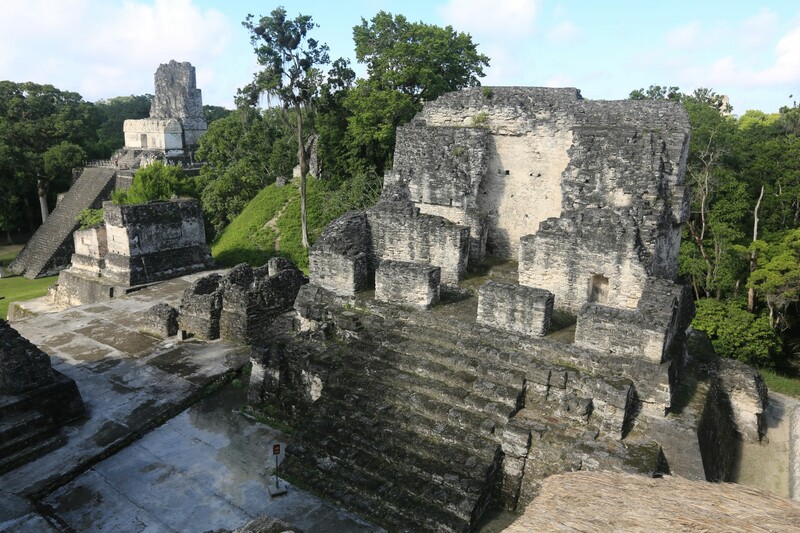 Guatemala, Belize and Southern Mexico represented the center of the Mayan Culture and all three countries have amazing opportunities to study the archeological sites that remain from what once was a massive civilization. It’s pretty mind blowing to imagine these places populated with the numbers of people that were actually present. 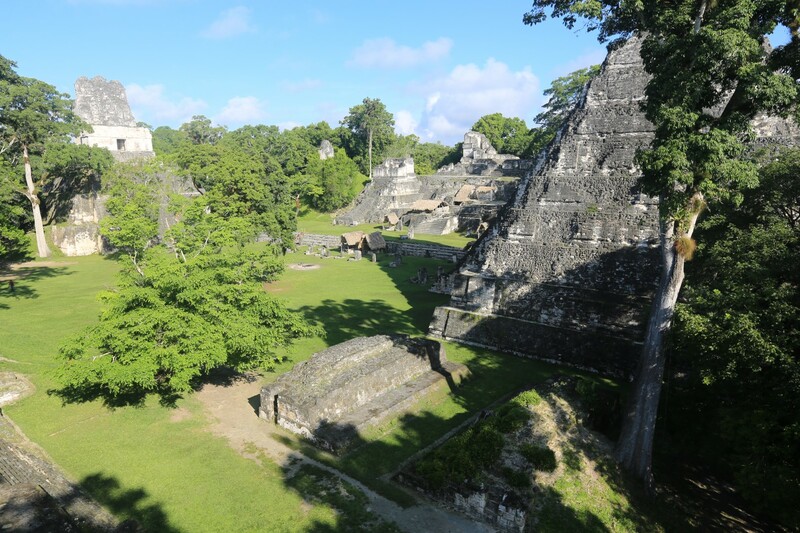 I was at the ruins of the city called Tikal in Guatemala and it’s just amazing that archeologists believe that the population peaked between 100,000 and 200,000 people in this city alone. 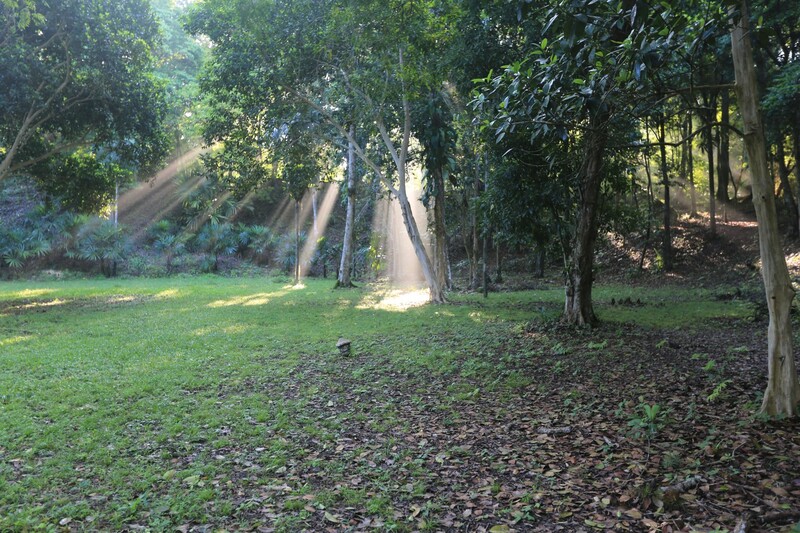 The day before I was at the site in Belize known as Caracol which is beleived to have 120-180,000 citizens as well. It’s especially relevant when you consider that modern Belize (as in today) has a population of only 330,000 people. 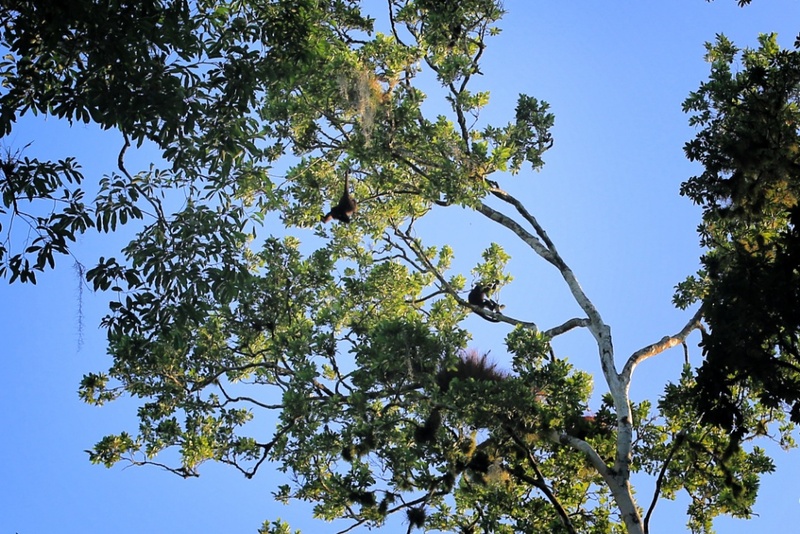 We climb down from the giant pyramid and immediately we actually get to see one of the families of howler monkeys in a tree at the base of the pyramid. Another lucky bonus! It’s amazing how an animal so small can make such a tremendous amount of noise. 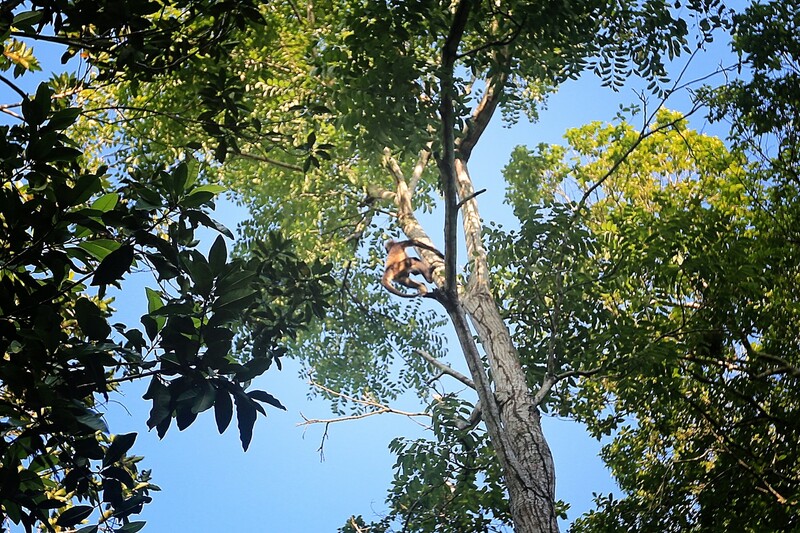 In a few minutes we also see a tribe of spider monkeys swinging along through the jungles. Spider monkeys – they don’t howl but they play! 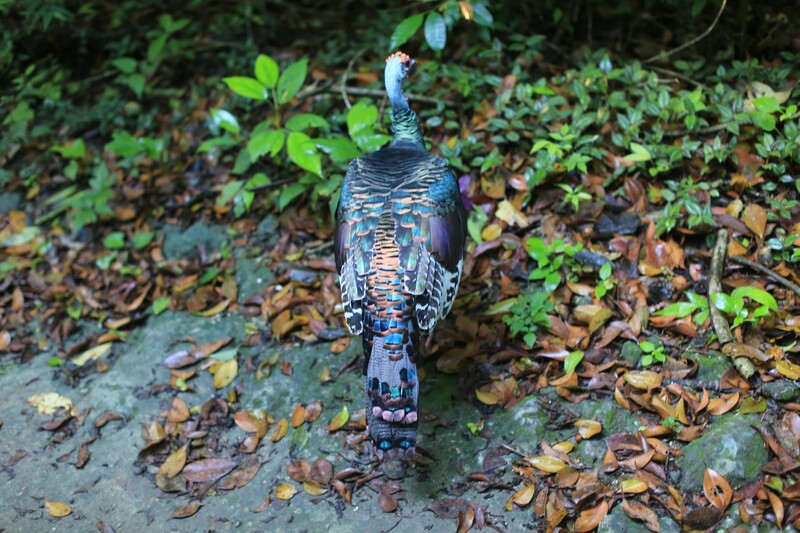 Add this to amazingly colored wild turkeys and a lone Coati and it’s not only a trip through the ruins, it’s a wildlife excursion! 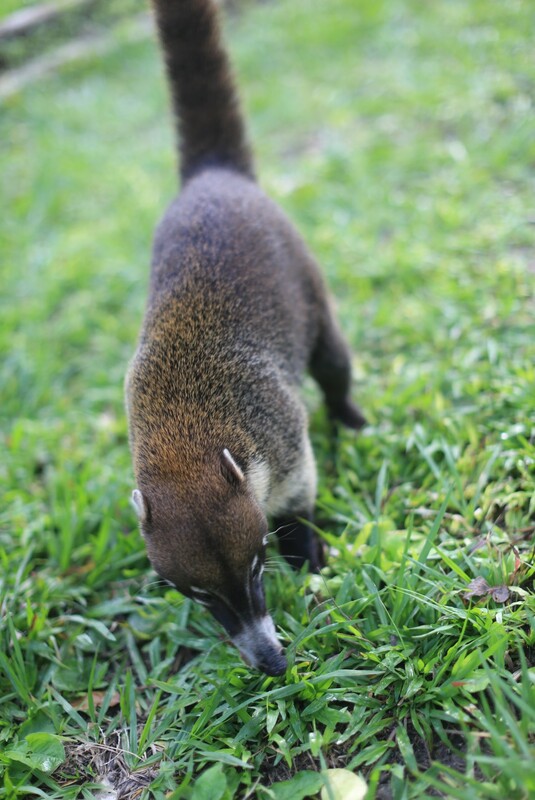 This cute animal is a Coati – super tame! Beautiful feathers on this wild turkey! Our guide is excellent and I learn a great deal about the place and the culture but in honesty it’s always hard for me to actually wrap my head around seeing these giant half crumbling structures and actually envisioning what the day to day life of over 100,000 people in this place would actually be like. Even though I know they were built for a purpose and used by actual people it still feels like an Indiana Jones movie set and maybe it’s OK not being able to mentally process it as more than that. Movie style lighting affect in the jungle! 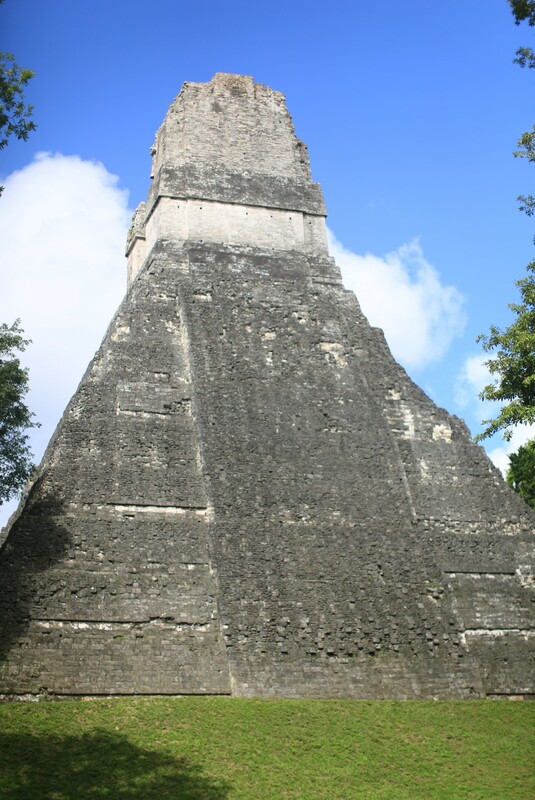 Logistically Tikal is actually easier reached from Belize than it is from Guatemala city. It’s really only like and hour and a half from the Belizean border whereas it’s 8 hours by bus or car from Guatemala city. It’s probably not high on the list of places for a vacaction destination but for someone traveling in Central America I would place it high on the list of places to go – especially at sunrise. Next stop – Antigua, Guatemala! Yeah I think you can only do the sunrise from Flores because of timing but man it was awesome! ← Tubing + Caves + Jungle + Blue Water = Fun. Cave Tubing in Belize!